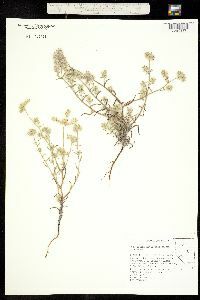 Duration: Annual Nativity: Native Lifeform: Forb/Herb General: Annual herbs, 10-60 cm tall; stems unbranched or branched throughout, strigose (covered with stiff, appressed hairs), some of the hairs ascending or spreading. 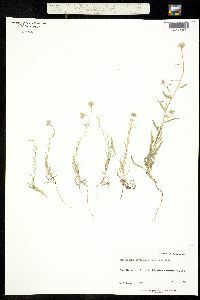 Leaves: Alternate and sessile; blades linear to oblong, 1-4 cm long, strigose with appressed hairs, and bristly with larger, more or less spreading hairs. 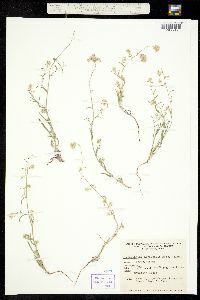 Flowers: White, in scorpioid spikes to 15 cm long, these often paired or in groups of 3 at the ends of branches, with flowers generally dense near the tips of the spikes and well-spaced below; sepals linear, 3-3.5 mm long in flower, extending to 6-10 mm in fruit, densely rough-hairy and bristly, the hairs appressed and the bristles spreading; corolla funnelform, white, the limb 1-2 mm wide. Fruits: Nutlets 4 per flower, 2-2.5 mm long, lanceolate, densely tubercled, the margin rounded to sharp-angled, the groove flared open at base and more or less closed above. 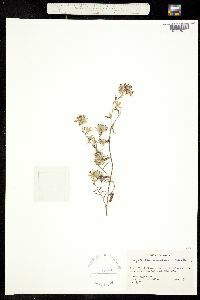 Ecology: Found on sandy, gravelly soils, especially in creosote shrublands, below 4,000 ft (1219 m); flowers March-May. 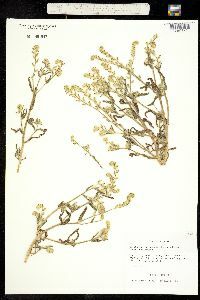 Distribution: CA, s NV, s UT, AZ; south to n MEX (Sonora, Baja California) Notes: Cryptantha is a genus of bristly herbs with white or yellow flowers in spikes that are usually 1-sided and curling like a scorpion-s tail (-scorpioid-). The seeds, called -nutlets- in the borage family, are crucial to identification of the species. As the nutlets are quite small and difficult to examine in the field with a hand lens, it is usually necessary to make a collection of mature material for later identification under a dissecting scope. C. nevadensis is distinguished as a bristly annual, often slender but sometimes much-branched, with lanceolate leaves and spikes in clusters of 2 or 3 at branch tips. 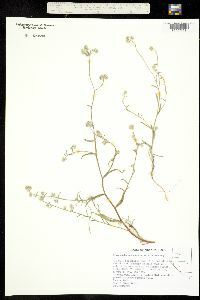 It is quite similar to C. barbigera, with the primary difference being the hairs on the stems and leaves. C. nevadensis is covered with a mixture of spreading bristles and appressed hairs, while C. barbigera only has spreading bristles (the spreading bristles on both species are just visible to the naked eye, but to see the appressed hairs, use a hand lens). 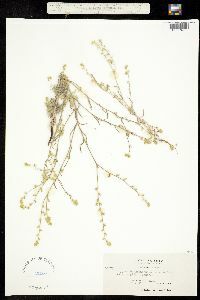 C. nevadensis is frequently found under shrubs and bushes. Ethnobotany: Unknown, but other species in the genus have uses. Synonyms: None Editor: SBuckley 2010, AHazelton 2015 Etymology: Cryptantha comes from the Greek krypto, "hidden," and anthos, "flower," a reference to the first described species in the genus which has inconspicuous flowers that self-fertilize without opening; nevadensis means of or from Nevada.